Come and join me on one of my courses or workshops and share my love of sewing. I currently run classes for complete beginners and also for more experienced sewers and offer small friendly group sessions as well as one to one tuition. New Class dates are listed below. The Sewing Academy was born from the desire to share the knowledge that I have gained from working as a designer in the fashion industry and also my experience of working with fashion students in local colleges and universities. Sewing can be great fun and a hobby that can be enjoyed by young and old. My classes are a great way for beginners to learn at a steady pace and for more experienced sewers to brush up and refine their skills. Whatever your experience a warm welcome awaits you at the Sewing Academy. Please contact me for more information or to reserve your place on a course. A one day workshop aimed at complete beginners or those with very little sewing experience. The workshops are always relaxed and fun and the aim is for you to walk away feeling confident and inspired! Please bring along your sewing machine if you have one. If you require one to loan please message in advance to reserve one for the day. A one day workshop ideal for those who have attended one of my beginners workshops or those who have some basic sewing knowledge. 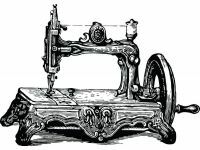 You will need to be able to thread your machine and the confidence to sew very easy projects. During the session you will make a fully lined zipped make up bag to take home on the day. Please note machines are available to loan, however I would recommend that if possible you bring your own machine to lessons.